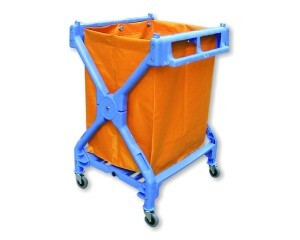 For janitorial staff and cleaners, a trolley is an essential item which offers a number of practical uses, with hoops for hanging bin liners or laundry sacks from, and shelving to allow the easy transportation of janitorial supplies around school buildings, factories, hotels and offices. 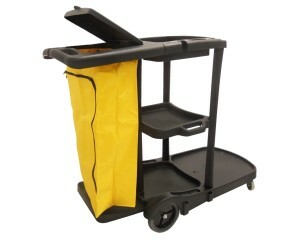 Product MC160 Janitorial trolley, which offers an economical solution to your janitorial needs and comes complete with a yellow PVC bag. Ideal for both internal and external cleaning and janitorial use with hooks to hang refuse bags and front platform for mop buckets. This is a multi-use trolley with trays to store cleaning supplies. This janitors trolley makes transportation of cleaning equipment easier and more cost effective in working environments such as factories, hospitals , hotels, guest houses and residential care homes. 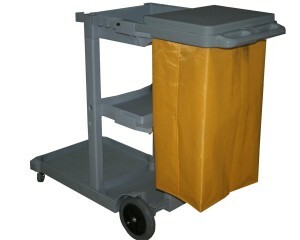 Product AF08158 Laundry Cart is a folding trolley which is ideal for the collection of soiled washing and light waste. Complete with a strong yellow PVC sack with a base frame which helps support the bottom of the sack.